Last week against the defending Super Bowl champion Philadelphia Eagles, the Patriots defense had their way with the offensive line, racking up eight sacks and hitting the Eagles’ quarterback group 11 times over the course of the game – this week, against a banged-up offensive line that featured a second-year player getting his first NFL start at left tackle and lost the starter at right tackle after only eight snaps? Zero sacks, one quarterback hit. Not bad for a group playing together for the first time – not bad at all. 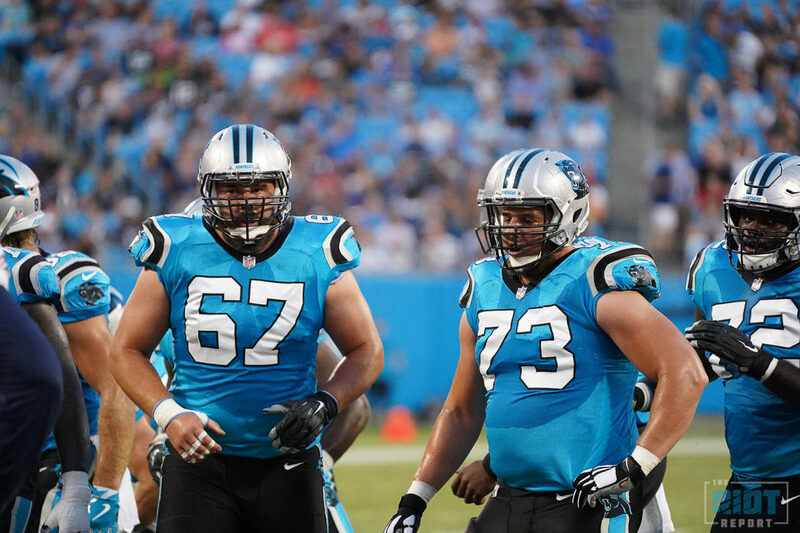 This offensive line has already been decimated by injuries; 60% of the presumed starters – Matt Kalil, Daryl Williams and Amini Silatolu – did not practice this week and have no timetable for return, and the loss of Sirles early in the game hurts the team not only from a depth standpoint, but from an emotional standpoint. One of the reasons Sirles came here in the offseason was for the opportunity to start, and only eight snaps after getting the nod at right tackle, he was limping to the sidelines and being carted to the locker room with a hamstring injury. 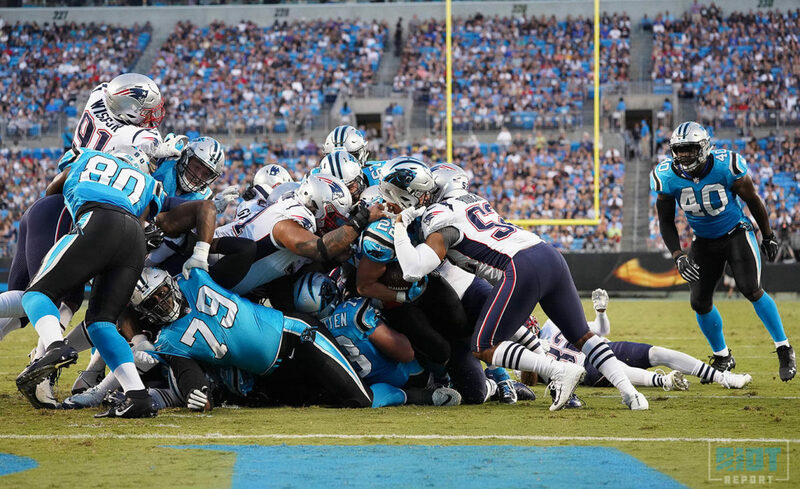 Ron Rivera said after the game that Sirles would be evaluated over the weekend and the team would go from there – their solution on Friday night was Blaine Clausell, who played a team-high 60 snaps as he worked with both the first and second-team offensive lines; Clausell spent all of 2017 on the Panthers’ practice squad before being called up to the main roster for the playoff game against the Saints, although he wasn’t activated. So an offensive line combination of Moton-Van Roten-Kalil-Turner-Clausell played the majority of the first half and allowed the Panthers to rush for over four yards per carry and kept Cam Newton relatively clean as he completed nearly 65% of his passes. Just the way the coaches drew it up, right? With Amini Silatolu perhaps available to return to practice this upcoming week and Sirles’ status up in the air, it seems a foregone conclusion that the Panthers will be starting their fourth offensive line combination in as many preseason games as they hurtle towards a Week 1 matchup with the Dallas Cowboys, who have allowed the fifth-fewest rushing yards per game thus far in the preseason; whoever is filling the gaps along the front, whatever position they’re playing, if they can produce another performance like the one they had Friday night, it might be enough to be successful. Before NFL games, sheets are distributed in the press box to notify the media of any changes to the starting lineups – last night’s featured three changes – Van Roten replacing Silatolu at LG; Sirles replacing Kalil at left tackle (he actually started at right tackle) and Moton replacing Daryl Williams at right tackle, when he would actually be replacing Kalil at left tackle – the names were right, but the positions were incorrect. With the amount of changes along the line in only a month since training camp began in Spartanburg, you can forgive even the Panthers’ PR team for a little confusion.